I've been dreaming about a quick and easy sweater knit handbag for ages it seems -- imagining, designing, and sewing it... in my head. 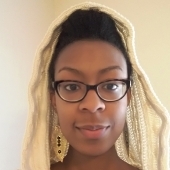 CF contributor Danielle, however, has gone ahead and sewn one in real life. Below is her finished project along with a few tips. Hello there! I'm back again for another sewing project with some gorgeous sweater knit fabrics. This time, it's the super interesting Color Grown Mesa Plaid Sweater Knit fabric from O! Jolly!. This fabric has a pronounced texture on one side, and a smooth, striped surface on the other side. So, of course, there's THE question -- which side do I want to be my "outside"? I quickly decided on the textured side. I wanted to do something different for this project, something other than a sweater or top. So, I chose a simple cross body handbag to make. Now there are tons -- I mean, TONS -- of free PDF patterns online for handbags. I found my pattern, the Day Out Purse on Sew Mama Sew. The one issue with this pattern is that it doesn't have a pattern piece for the strap. But that is a simple piece that you can cut out on your own. You may want a little short (strap) bag or a longer one. Just take a measurement over your shoulder or across your body in order to get the length of the strap. This fabric is a little more stable than some of the other sweater knits, but I definitely wanted to stabilize it more. An item like a handbag will be manipulated a lot, and having a stretched out handbag is probably not something most of us want. My first thought was to stabilize with some felted fabric. However, I was planning on making a smaller bag, and knew that a thick (1/4" almost) fabric would add too much bulk. 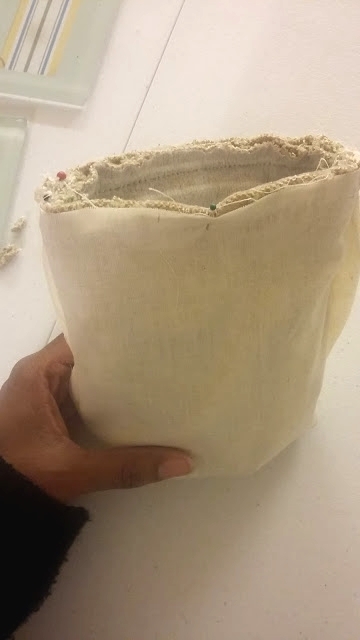 If you are making a larger bag, this may not play as big a role. Instead of fabric backing, I chose to just use fusible interfacing to stabilize it. 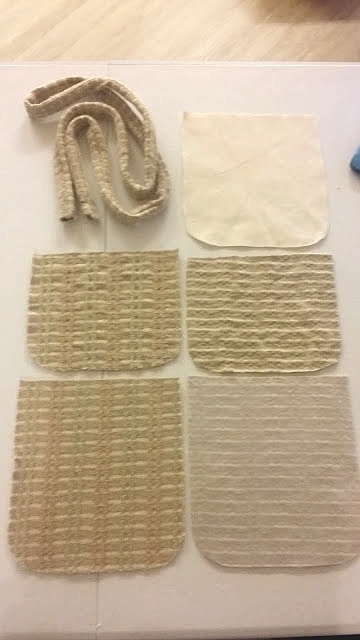 After fusing interfacing onto the wrong side of my sweater knit, I cut out all of my pieces. Note: I did not interface my "flap" pieces. In hindsight, I should have, so I would definitely recommend interfacing all pieces. 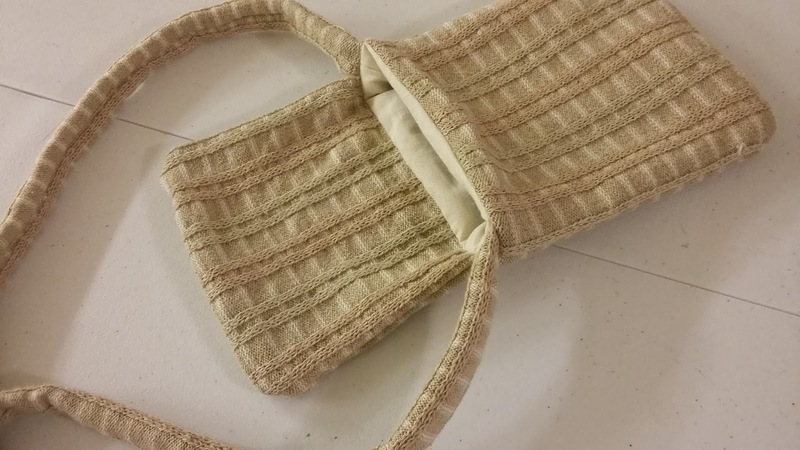 I had about 3/4 yard of the fabric, so for the straps, I cut out 2 strips -- 2.5 inches x 25 inches. I stitched them together to get one long strap. Then I folded them lengthwise, stitched 1/4" from the edge, and then turned right-side-out. The bag itself is very simple to make. With right sides together, I stitched around the sides and bottom edge of the bag, just leaving the straight edge open at the top. I repeated this with the lining and again with the flap. With the lining, I left an opening at the very bottom, to pull everything through at the end. Be sure to clip curves because sweater knits will produce bulky corners/curves. Then, I simply pinned everything to the outside of the bag, matching up ends of the straps with the side seams of the bag. 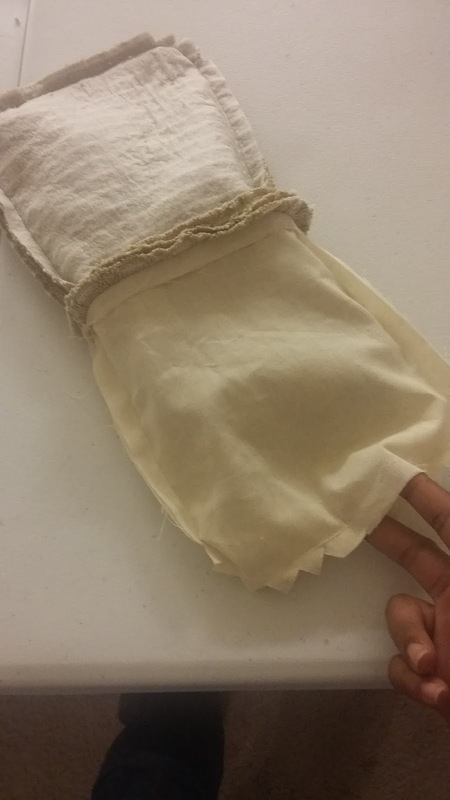 I positioned the flap (right side out) onto one side of the opening and then pinned the lining around the top edge of the bag exterior, sandwiching the flap and straps. After stitching all the way around, the bag was just about done. I pulled everything through the opening in the lining and voila! I only had to close the opening in the lining with a slipstitch. I did not use any kind of closure, but if you'd like to add an elastic loop (sewn into the seam of the flap) and a button, you can. Instructions on that type of construction, and even more variations are here. 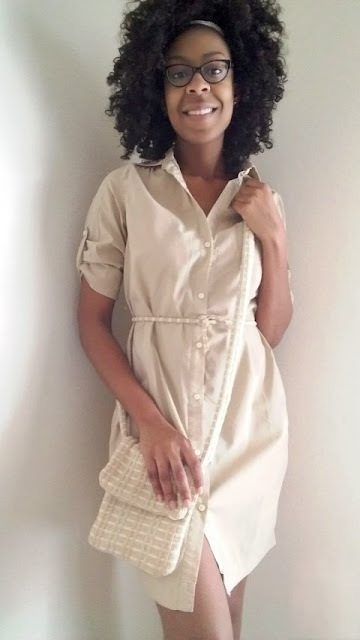 This is a quick, no fuss project that yields very nice results in a short amount of time and doesn't require advanced sewing skills. If you'd like to get your feet wet before diving into more complicated sweater knit adventures, this is definitely a good starting point. Happy sewing!